Casa de Pico will be at Oktoberfest 2011 La Mesa! Casa de Pico is gearing up for Oktoberfest in La Mesa Sep. 30-Oct. 1 & 2!. It’s quite an undertaking, but we are looking forward to a fun weekend grilling Carne Asada Tacos, Pollo Asado Tacos and Carnitas Tacos with all the trimmings. It’s always a fun event for the whole family and we always love being visited often by our loyal customers, as well as our new ones. Stop by and say hello. For those of you that don’t care so much for Bratwurst we’ll have some great alternatives for you. See you there! Come celebrate with us at Casa de Pico a very special day for all of our friends with Mexican heritage. We salute you and are thankful for your culture that you’ve shared with us. Viva Mexico! Celebrate 40 Great Years With Us! Casa de Pico, one of Diane Powers’ three signature San Diego Mexican restaurants, finished second in the annual “Best Of San Diego” readers poll conducted by the San Diego Union Tribune for 2011. Casa de Pico is located in the Grossmont Center in La Mesa, CA and will be celebrating it’s 40th anniversary on November 4th. Finishing first was Powers’ Casa Guadalajara in Old Town. Located on Taylor Street, next to one of San Diego’s finest destination shopping experiences, Bazaar del Mundo, Guadalajara has been a consistent winner of many awards for it’s fine foods and classic margaritas. 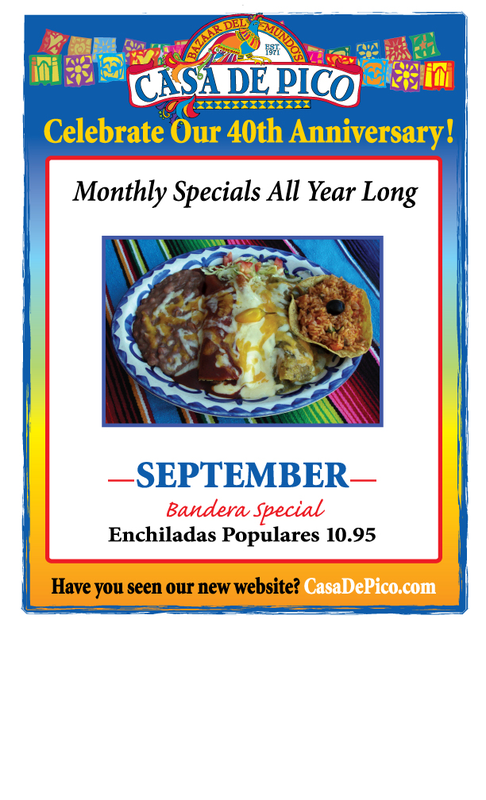 Not to be forgotten is Casa de Bandini, Powers’ third eatery which is considered the best Carlsbad mexican restaurant by many North County residents. Wherever you are in San Diego, visit one of our restaurants and experience the beauty and cultural experience each offers. It’s a feast for the eyes, as well as the palette. At Casa de Pico we thank you for your votes, your recognition, and your loyalty to our brand. We pledge to continue to offer you the best mexican restaurant dining experience in La Mesa and East County and will be working very hard to take the #1 spot next year in the U-T Poll!